In 1774, in retaliation for the Boston Tea Party of December 16, 1773, General Gage was sent to Boston with troops, and assumed the governorship. The colony’s Charter rights were abrogated by the Intolerable Acts, punitive measures enacted by the British Parliament in retaliation for acts of defiance by the colonists. Delegates from 67 towns arrived in Ipswich on Tuesday, Sept. 6, 1774 and the Ipswich Convention began deliberations regarding a Constitution for Massachusetts. Resolutions were adopted by unanimous vote, binding themselves to stand together in opposition to the Crown, demanding the resignation of officials holding office by Royal appointment, and declaring the Provincial Congress, soon to assemble, as absolutely necessary for the common safety. The Ipswich Convention met at the Town House, to the right of the Church on Meeting House Green. Ipswich woodcut, 1838 attributed to S. E. Brown. The First Massachusetts Provincial Congress met in Salem on Friday, October 7, 1774. Ipswich was represented by Captain Michael Farley and Mr. Daniel Noyes, schoolteacher and postmaster. It recommended that companies of Minutemen be organized, armed, and that they be “disciplined three times a week and oftener as opportunity may offer.” After the British withdrawal from Boston in March 1776, Massachusetts declared its independence, and the Provisional Congress governed the state until 1780. In 1778, a proposed Constitution was submitted, to be voted up or down by citizens of the state. It is said to be the first general referendum in the world. The Ipswich Convention reconvened on April 29, 1778 with delegates from Lynn, Salem, Danvers, Wenham, Manchester, Gloucester, Ipswich, Newburyport, Salisbury, Methuen, Boxford and Topsfield to review the proposed State Constitution. That the present situation of this State renders it best that the framing of a Constitution therefore should be postponed. That a bill of rights clearly ascertaining and defining the rights of conscience and that security of person and property ought to be settled and established previous to the ratification of any constitution for the State. That the executive power in any State ought not to have any share or voice in the legislative power in framing the laws. That any man who is chosen Governor ought to be properly qualified in point of property. That where the legislative power is rested in a house or houses of representatives all the members of the State ought to be equally represented. That the mode of representation proposed in the sixth article of the constitution is not so equal a representation as can reasonably be devised. That therefore the mode of representation in said sixth article is exceptionable. That the representation proposed in said article is also exceptionable as it will produce an unwieldy assembly. That the mode of election of Senators pointed out in the Constitution is exceptionable. That the rights of conscience and the security of person and property each member of the State is entitled to are not ascertained and defined in the Constitution with a precision sufficient to limit the legislative power. That the numbers that constitute a quorum in the House of Representatives and Senate are too small. That the supreme executive officer is not vested with proper authority and because an independence between the executive and legislative body is not preserved. That a due independence is not kept up between the supreme legislative judicial and executive powers nor between any two of them. That the supreme executive power is not preserved distinct from and independent of the supreme legislative power. That the power of granting pardons is not solely vested in the supreme executive power of the State. That the delegates for the Continental Congress may be elected by the House of Representatives when all the Senators may vote against the election of those who are delegated. That the rights of conscience are not therein clearly defined and ascertained and further because the free exercise and enjoyment of religious worship is there said to be allowed to all the protestants in the State when in fact that free exercise and enjoyment is the natural and uncontrollable right of every member of the State. 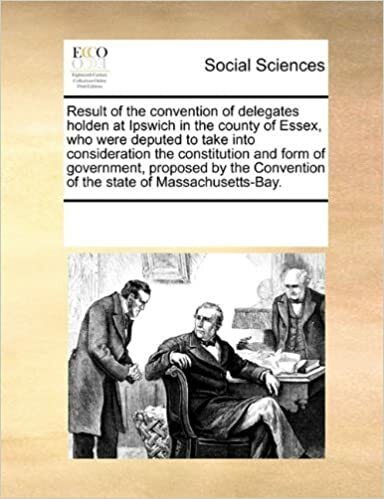 The Convention adjourned to May 12, to be held at Ipswich, for the purpose of ascertaining of the true principles of government applicable to the territory of the Massachusetts Bay, and to delineate the general outlines of a constitution. A committee was selected to report back to the body of representatives. The entire proceedings and resolutions of the 1778 sessions of the Ipswich Convention are known as “The Essex Result,” and were published in the 67-page volume, “Results of the Convention of Delegates, Holden at Ipswich in the County of Essex, who were Deputed to take into Consideration the Constitution and Form of Government Proposed by the Convention of the State of Massachusetts Bay” recorded by Theophilus Parsons, a young lawyer who would later became Chief Justice of the Massachusetts Supreme Judicial Court. “The most virtuous states have become vicious. The morals of all people in all ages have been shockingly corrupted. The rigidly virtuous Spartans who banished the use of gold and silver, who gloried in their poverty for centuries, at last fell a prey to luxury and corruption. The Romans…were at last dissolved in luxury, courted the hand of bribery, and finally sold themselves as slaves and prostrated their country to tyrants the most ignominious and brutal. The proposed Massachusetts Constitution was rejected in a referundum by the male citizens of the Commonwealth on June, 1788, by a vote of 2083 Yea, 9972 Nay. It met with strong opposition from the citizens of Essex County for the absence of a statement of individual rights, and for not providing for the separation of powers. A new Constitutional Convention was held the following year, and tje Constitution of the Commonwealth of Massachusetts was rewritten, John Adams, being the principal author. Voters approved the new document on June 15, 1780, and it went into effect on October 25. 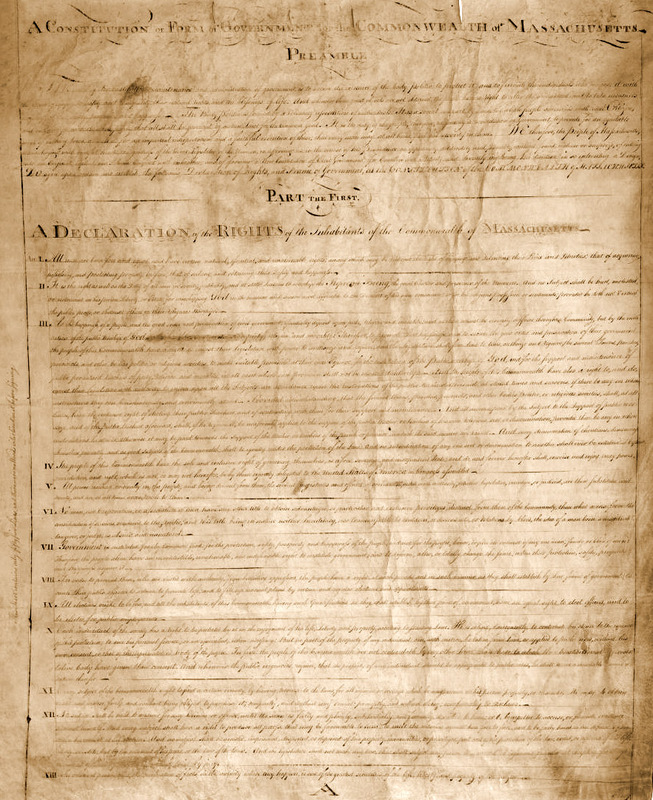 It is the oldest functioning written constitution in the world, and served as a model for the Constitution of the United States, written in 1787. “The end of the institution, maintenance, and administration of government, is to secure the existence of the body politic, to protect it, and to furnish the individuals who compose it with the power of enjoying in safety and tranquillity their natural rights, and the blessings of life: and whenever these great objects are not obtained, the people have a right to alter the government, and to take measures necessary for their safety, prosperity and happiness. Results of the Convention of Delegates, Holden at Ipswich in the County of Essex, who were Deputed to take into Consideration the Constitution and Form of Government Proposed by the Convention of the State of Massachusetts Bay by Theophilus Parsons, printed and sold by John Mycall, 17788. Gordon, Thank you so much for this fascinating and well-researched article. We family historians with roots in 17th and 18th century Ipswich, Essex, and neighboring towns owe you an enormous debt of gratitude, not only for this article but for so many others. Thanks Judith! I wasn’t born here, but I definitely belong.